Preheat Oven to 350°F after step 3. In the bowl of an electric mixer with the paddle attachment, cream together the 3 sticks of butter and 1 cup of sugar on medium speed until they are combined. Add 1 tsp vanilla. (You can use a hand mixer or a wooden spoon for this). In a separate bowl, mix together 3 1/2 cups of flour and 1/4 tsp of salt and add 1 cup at a time into the sugar/butter mixture. Mix on low speed until the dough starts to come together. The sides of your bowl should be pretty clean when it's done. (If using a hand mixer, you will have to mix in the flour and salt by hand or using a wooden spoon). Shape the dough into a disk and cover it with plastic wrap. Refrigerate about 30 minutes. Remove dough from the fridge and roll ¼ of the dough at a time on a floured surface slightly larger 1/8” thick. Keep any unused portion wrapped up. Use cookie cutters to stamp out your cookies. I used a straw to make the hole in the center. Have a sharp spatula or food scraper on hand to pick them up easier. Place all cookies on an ungreased baking sheet and bake for 10 to 12 minutes, or until the edges begin to turn golden. Let cookies cool to room temperature, then spread a thin layer of raspberry preserves on the flat side of half of the cookies. Press cookies together and dust the tops with powdered sugar. Keep them in tupperware in the fridge up to 3 days. 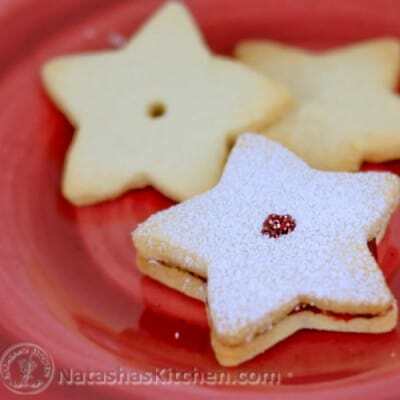 These cookies were adapted from Barefoot Contessa's Linzer cookies. You can add some ground nuts to the batter and have what are called “linzer” cookies. Raspberry preserves and raspberry jam is not the same thing. Also, sugar free preserves are nasty so don't even go there! If you want to serve the cookies without the raspberry preserves, cut them ¼” thick and bake for 20 to 25 minutes at 350°F. Try drizzling them with melted chocolate!